Tank heaters pre-heat a limited amount of water in their tank. You can get bigger tanks, but they’re expensive and there’s still a limit. If you use up all the hot water in the tank, you run out until it refills and reheats. This is what makes taking a long shower no fun. Tankless heaters heat up water as it’s needed—whenever you turn the faucet. They can bring water up to steaming, soothing temperatures in a matter of seconds. They can provide hot water indefinitely. A tank heater operates continuously. That means it’s running even when you’re asleep, and much of that hot water will never even be used. That’s a lot of wasted energy—that you pay for. A tankless heater only heats water on demand. It’s a smaller, compact system that flash-heats water when you need it, and turns off as soon as you turn off the faucet. Tankless heaters are designed to save energy. Tank heaters cost less up front but are expensive to run and wear out sooner. Tankless heaters cost slightly more up front, but can save you substantially on your monthly bills. Comparing a standard tank heater (50-gallon, electric) with an equivalent tankless (condensed gas-fired unit), the tankless unit can reduce energy costs by 60% or more. Tank Heaters are old technology, and they have flaws. Minerals build up inside the tank as it’s cooked over and over. 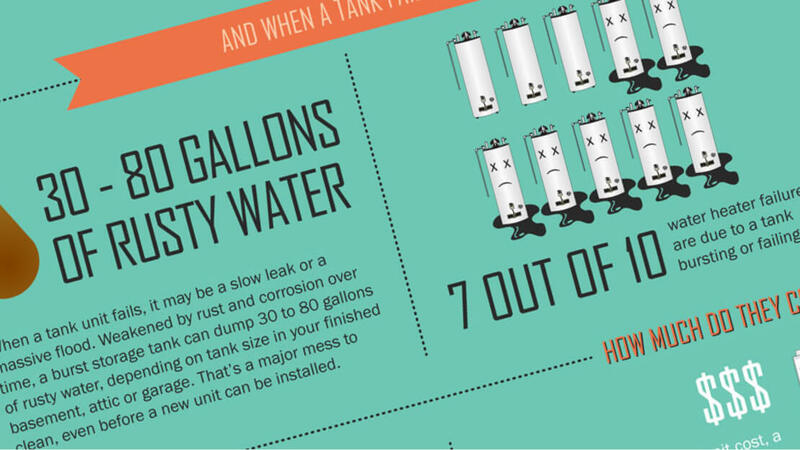 Most tanks last only 10-12 years before they have to be replaced, and typically come with just a 6-year warranty. Tankless Heaters are modern and more effective. They last up to 20 years with very little maintenance. And Noritz backs most water heaters with a 10-year warranty or longer. Isn’t it time your home made the switch? The water heater is probably the appliance least thought about in the home – until it fails. And when water heaters go bad, many do so in grand (ugly) fashion. Nearly three of every four water heaters fail due to a tank bursting or leaking 30 to 80 gallons of rusty water – depending on tank size – in your finished basement, attic or garage. Look for energy-efficient, certified ENERGY STAR water heaters, as new technologies can shave anywhere from 7 to 55 percent off household water-heating costs. Click the infographic to view it at full size.